Following the jaw-dropping $50 million funding of Quora, a Palo Alto, Calif.-based knowledge community, folks from New York-based research firm, CB Insights crunched some data and came up with the following stats about the Facebook Mafia – aka people who left Facebook to start their own companies. 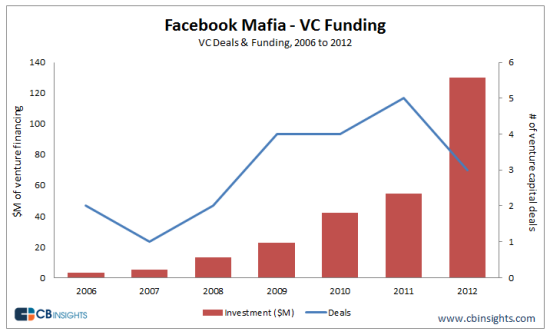 “The Facebook Mafia isn’t waiting for an IPO to strike out on their own as company alumni have already raised $271 million of venture capital funding since 2006. And the Facebook Mafia’s momentum appears to be accelerating with the group pulling in $130 million in just the first 5.5 months of 2012, a 137% increase over all of 2011, and the highest total in the last 6.5 years (graph below). For those unfamiliar with the term, the Facebook Mafia refers to alumni of Facebook who’ve gone on to found new startup companies. Interestingly, the group of Facebook Mafia financiers has been quite diverse as CB Insights data identified 67 different investors who’ve invested in at least one Facebook Mafia company. Only the 6 venture capital firms who have invested in 2 or more Facebook alumni companies are given below. Some of the more well-known companies include Asana, Quora, Path and Cove (which has since been acquired by Dropbox.) So far Greylock, which is an investor in Facebook has done three investments in companies started by Facebook Alumni. First Round has done two investments, much like Index Ventures, Redpoint Ventures and Ron Conway’s SV Angel. Benchmark Capital, which snagged Matt Cohler as a partner has done two – Asana and Quora. Benchmark through Cohler is also an investor in Peixe Urbano, a company started by early Facebook employee, Julio Vasconcellos. He is also personally invested in Path, a company started by Dave Morin. I am pretty sure, we will see many more investments and more diverse groups joining the ranks in the coming weeks. Hey, who doesn’t want some of the pixie dust of a hit IPO company! It would be good to see comparisons with other alumni groups. I would think Oracle’s would be the best funded and most successful. But, investors like to invest in people with experience so it shouldn;t be surprising that Facebook alumni can attract funding. The $271m since 2006 doesn’t seem like a lot, especially if you take out the the big hitters like the $50m Quora funding and that later stage ventures raise more money for expansion. Do you think the Facebook Mafia will be more like the PayPal Mafia or the Microsoft Mafia? Most of the Microsoft “founders” who started their own companies did nothing more than prove that Bill Gates was the real business genius and they were just along for the ride. But the PayPal Mafia all hit their own home runs.